Iridium is the only truly global satellite solution providing voice and data solutions with complete coverage of the earth (including oceans, airways and Polar Regions). Iridium delivers essential communications services to and from remote areas where no other form of communication is available. The Iridium constellation consists of 66 low-earth orbiting (LEO), cross-linked satellites and has multiple in-orbit spares. The constellation operates as a fully meshed network and is the largest commercial satellite constellation in the world. The Iridium service is ideally suited for industries such as maritime, aviation, government/military, emergency/humanitarian services, mining, forestry, oil and gas, heavy equipment, transportation and utilities. 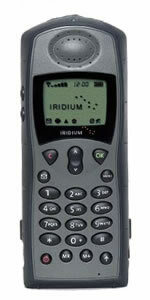 Get started using Iridium by purchasing a phone and activating a service plan today. The Hughes 9505A Iridium phone is water, shock & dust resistant for rugged environments. Larger than a typical cell phone, it is still capable of being carried in a backpack or on a hip holster. The unit weighs only 13.2 ounces but amazingly gives you up to 3.2 hours of talk time and 30 hours of standby time on a single charge. The 9505A is Data Capable allowing it to be connected to a laptop with an optional data kit to connect directly to the Internet. The phone also comes dual SMS capable standard allowing you to send and receive Short Message Service messages. Prepaid costs are expressed in Units. They are measure in this manner so that it is easier to express the discount for purchasing larger plans. Units not used by the end of the Valid period are not refundable.